Flip Flops: Fashionable but Flawed! During the warm summer months, flip-flops are a go-to shoe for beach vacations while playing tourist or for quick shopping trips. It is becoming more and more apparent that these easy, fashionable and often affordable shoes are extremely flawed when it comes to keeping you and your feet safe and healthy! A recent study shared findings that these flimsy shoes are to blame for “more than a million car accidents or close calls every year.” These shoes can easily get stuck under the pedals and significantly impact breaking time. Added to that are the numerous foot injuries and problems that can develop from wearing these sandals on a regular basis. 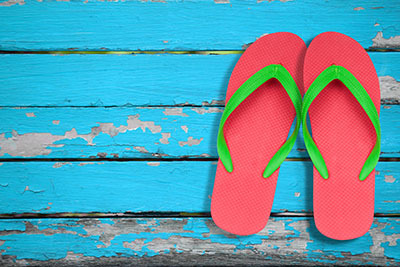 For the most part, flip-flops stay true to their name – they are floppy and flimsy. Most of them can literally be bent in half. This is not the kind of support and cushioning feet need over the course of the day. At Dallas Podiatry Works we often hear complaints of tired feet, plantar fasciitis, sore leg muscles and lower back pain as a result of wearing this type of shoe. For anyone with gait instability or diabetes, these shoes can be even more dangerous as they do not promote good balance or support and leave feet at high risk for injury. With the amount of steps we take in a day and the level of exercise we are encouraged to participate in, these flimsy shoes are risky. Why invite foot and other problems when you don’t have to? Drs. Joel Brook and David Northcutt can suggest numerous summer sandal options that are fashionable yet favorable for your feet. The American Podiatric Medical Association also has a fantastic list of shoes that have been highlighted as great choices to maintain foot health. Look for sandals with good arch support, motion control, cushioning and comfort. If your feet are already flawed or you have foot pain after sporting flip-flops for most of the summer, please contact us for treatment! Make an appointment todayby calling our office in Dallas, TX at (972) 566-7474 or in Plano, TX (972) 943-3323.